Charles Monroe Schulz (November 26, 1922 – February 12, 2000) was a twentieth century American cartoonist best known worldwide for his Peanuts comic strip. Unlike such famous cartoon artists as Walt Kelly and Al Capp, Schulz was not a political commentator but can best be described as commenting on human life. In journalism, his work would be characterized as "human interest stories." Schulz many times touched on religious themes in his work, including the classic television cartoon, A Charlie Brown Christmas (1965), which features the character Linus van Pelt quoting the King James Version of the Bible, Luke 2:8-14. to explain "what Christmas is all about." In personal interviews, Schulz noted that Linus represented his spiritual side. Schulz's cartoons were everyday, earthly stories revealing eternal truths. He explored such emotive issues as loss, suffering, and the limitations of human life and the apparent indifference of God. Following his death, Saint Paul, Minnesota, began a four year tribute to its favorite native cartoonist. Charles M. Schulz was born in Minneapolis, Minnesota, and grew up in Saint Paul. He was the only child of Carl Schulz, who was German, and Dena, who was Norwegian. His uncle nicknamed him "Sparky" after the horse Spark Plug in the Barney Google comic strip. Schulz attended St. Paul's Richard Gordon Elementary School, where he skipped two half-grades. He became a shy and isolated teenager, perhaps as a result of being the youngest in his class at Central High School. After his mother died in February 1943, he was drafted into the United States Army and was sent to Camp Campbell in Kentucky. He was shipped to Europe two years later to fight in World War II as an infantry squad leader with the U.S. 20th Armored Division. After leaving the army in 1945, he returned to Minneapolis, where he took a job as an art teacher at Art Instruction, Inc.—he had taken correspondence courses before he was drafted. Schulz, before having his comics published, began doing lettering work for a Catholic comic magazine titled Timeless Topix, where he would rush back and forth from dropping off his lettering work and teaching at Art Instruction Schools, Inc.
Schulz's drawings were first published by Robert Ripley in his Ripley's Believe It or Not! His first regular cartoons, Li'l Folks, were published from 1947 to 1950, by the St. Paul Pioneer Press; he first used the name Charlie Brown for a character there, although he applied the name in four gags to three different boys and one buried in sand. The series also had a dog that looked much like Snoopy. In 1948, Schulz sold a cartoon to the Saturday Evening Post; the first of seventeen single-panel cartoons by Schulz that would be published there. In 1948, Schulz tried to have Li'l Folks syndicated through the Newspaper Enterprise Association. Schulz would have been an independent contractor for the syndicate, unheard of in the 1940s, but the deal fell through. Li'l Folks was dropped in January 1950. Later that year, Schulz approached the United Feature Syndicate with his best strips from Li'l Folks, and Peanuts made its first appearance on October 2, 1950. The strip became one of the most popular comic strips of all time. He also had a short-lived, sports-oriented comic strip called It's Only a Game (1957–1959), but abandoned it due to the demands of the successful Peanuts. From 1956 to 1965, he also contributed a single-panel strip (Young Pillars) featuring teenagers, to Youth, a publication associated with the Church of God (Anderson). Like Charlie Brown, Schulz's father was a barber and his mother a housewife. Schulz had a dog when he was a boy. Unlike Snoopy, it was a pointer. Eventually, it was revealed that Snoopy had a desert-dwelling brother named Spike. Spike's residence, outside of Needles, California, was likely influenced by the few years (1928–1930) that the Schulz family lived there; they had moved to Needles to join other family members who had relocated from Minnesota to tend to an ill cousin. Schulz was also shy and withdrawn. Schulz's "Little Red-Haired Girl" was Donna Johnson, an Art Instruction Schools accountant with whom he had a relationship. She rejected his marriage proposal, but remained a friend for the rest of his life. Linus and Shermy were both named for good friends of his. Lucy was inspired by Joyce Halverson, his first wife. Schulz moved briefly to Colorado Springs, Colorado. He painted a wall in that home for his daughter Meredith, featuring Patty, Charlie Brown, and Snoopy. The wall was removed in 2001 and donated to the Charles M. Schulz Museum in Santa Rosa, California. The restored artwork by Schulz is printed in the paperback edition of Chip Kidd's book, Peanuts: The Art of Charles M. Schulz. Schulz's family returned to Minneapolis and stayed until 1958. They then moved to Sebastopol, California, where Schulz built his first studio. It was here that Schulz was interviewed for the unaired television documentary, A Boy Named Charlie Brown. Some of the footage was eventually used in a later documentary titled, Charlie Brown and Charles Schulz. Schulz's father died while visiting him in 1966, the same year his Sebastopol studio burned down. By 1969, Schulz had moved to Santa Rosa, California, where he lived and worked for more than 30 years. Schulz had a long association with ice sports, as both figure skating and ice hockey featured prominently in his cartoons. In Santa Rosa, he was the owner of the Redwood Empire Ice Arena, which opened in 1969. Schulz's daughter Amy served as a model for the skating in the 1980 television special She's a Good Skate, Charlie Brown. Schulz also was very active in Senior Ice Hockey tournaments; in 1975, he formed Snoopy's Senior World Hockey Tournament at his Redwood Empire Ice Arena, and in 1981, Schulz was awarded the Lester Patrick Trophy for outstanding service to the sport of hockey in the United States. In 1998, he hosted the 1st ever Over 75 Hockey Tournament (although goalies could be younger—60). In 2001, Saint Paul renamed The Highland Park Ice Arena the "Charles Schulz Arena" in his honor. The first full-scale biography of Schulz, Peanuts and Schulz: A Biography, by David Michaelis, was released in October 2007. The book has been heavily criticized by the Schulz family, while Michaelis maintains that there is "no question" his work is accurate. However, fellow artist Bill Watterson (creator of Calvin & Hobbes) feels that the biography does justice to Schulz's legacy, while giving insight into the emotional impetus of the creation of the strips. 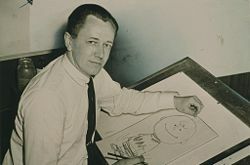 In light of David Michaelis' biography and the controversy surrounding his interpretation of the personality that was Charles Schulz, responses from his family shed some intimate knowledge about the artist's true persona on the Cartoon Brew website—beyond that of mere artist. Peanuts ran for nearly 50 years without interruption and appeared in more than 2,600 newspapers in 75 countries. In November 1999, Schulz suffered a stroke, and later it was discovered that he had colon cancer that had metastasized to his stomach. Because of the chemotherapy and the fact he could not read or see clearly, he announced his retirement on December 14, 1999. This was difficult for Schulz, and he was quoted as saying to Al Roker on The Today Show, "I never dreamed that this would happen to me. I always had the feeling that I would stay with the strip until I was in my early eighties, or something like that. But all of sudden it's gone. I did not take it away. This has been taken away from me." Schulz died in Santa Rosa of a heart attack at 9:45 p.m. on February 12, 2000, at age 77. He was interred in Pleasant Hills Cemetery in Sebastopol. The last original strip ran the day after his death. In it, a statement was included from Schulz that his family wished for the strip to end when he was no longer able to produce it. Schulz had previously predicted that the strip would outlive him, with his reason being that comic strips are usually drawn weeks before their publication. As part of his will, Schulz had requested that the Peanuts characters remain as authentic as possible and that no new comic strips based on them be drawn. United Features has legal ownership of the strip, but his wishes have been honored, although reruns of the strip are still being syndicated to newspapers. New television specials have also been produced since Schulz's death, but the stories are based on previous strips. Schulz had been asked if, for his final Peanuts strip, Charlie Brown would finally get to kick that football after so many decades. His response: "Oh, no! Definitely not! I couldn't have Charlie Brown kick that football; that would be a terrible disservice to him after nearly half a century." He was honored on May 27, 2000, by cartoonists of 42 comic strips paying homage to him and Peanuts. Schulz received the National Cartoonist Society Humor Comic Strip Award in 1962, for Peanuts, the Society's Elzie Segar Award in 1980, their Reuben Award for 1955 and 1964, and their Milton Caniff Lifetime Achievement Award in 1999. He was also a hockey fan; in 1981, Schulz was awarded the Lester Patrick Trophy for outstanding contributions to the sport of hockey in the United States, and he was inducted into the United States Hockey Hall of Fame in 1993. On June 28, 1996, Schulz was honored with a star on the Hollywood Walk of Fame, adjacent to Walt Disney's. A replica of this star appears outside his former studio in Santa Rosa. Schulz is a recipient of the Silver Buffalo Award, the highest adult award given by the Boy Scouts of America, for his service to American youth. On June 7, 2001, the United States Congress posthumously awarded Schulz the Congressional Gold Medal, the highest civilian honor the U.S. legislature can award. Schulz's widow, Jean, accepted the award on behalf of her late husband. In 2000, the Sonoma County Board of Supervisors rechristened the Charles M. Schulz—Sonoma County Airport in his honor. The airport's logo features Snoopy in goggles and scarf, taking to the skies on top of his red doghouse. 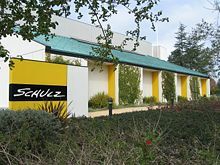 The Charles M. Schulz Museum and Research Center in Santa Rosa, opened on August 17, 2002, two blocks away from his former studio and celebrates his life's work and art of cartooning. A bronze statue of Charlie Brown and Snoopy stands in Depot Park in downtown Santa Rosa. The Jean and Charles Schulz Information Center at Sonoma State University is one of the largest libraries in the CSU system and the state of California, with a 400,000 volume general collection and with a 750,000 volume automated retrieval system capacity. The $41.5 million building was named after Schulz and his wife donated a large sum of the money, $5 million, needed to build and furnish the structure. The library opened in 2000, and now stands as one of the largest buildings in the university. Peanuts on Parade has been Saint Paul, Minnesota’s tribute to its favorite native cartoonist. It began in 2000, with the placing of 101 five-foot tall statues of Snoopy throughout the city of Saint Paul. Every summer for the next four years, statues of a different Peanuts character were placed on the sidewalks of Saint Paul. In 2001, there was Charlie Brown Around Town, 2002 brought Looking for Lucy, then in 2003 along came Linus Blankets Saint Paul, ending in 2004, with Snoopy lying on his doghouse. The statues were auctioned off at the end of each summer, so some remain around the city but others have been relocated. Permanent, bronze statues of the Peanuts character are also found in Landmark Plaza in downtown Saint Paul. ↑ New Yorker, Growing up with Charley Brown. Retrieved November 18, 2007. ↑ New York Times, Biography of Peanuts Creator Stirs Family. Retrieved November 18, 2007. ↑ Wall Street Journal Online, The Grief That Made Peanuts Good Retrieved November 18, 2007. ↑ www.chivian.com, Cartoonists pay tribute to Charles M. Schulz and Peanuts. Retrieved November 18, 2007. This page was last modified on 6 February 2017, at 22:26.